BRECObasic® Timing Belts – Simple. Effective. Safe. BRECObasic® polyurethane timing belts are especially well-suited for simple tasks in linear and transport technology. With BRECObasic polyurethane timing belts, Mulco’s partner company is now offering customers a brand-name product for simple tasks in linear and transport technology at a low price. This BRECO Antriebstechnik timing belt is produced exclusively for the Mulco group and can be used anywhere where high timing belt quality is required, but special characteristics such as limited tolerances, special stability and processing capability are of secondary importance. 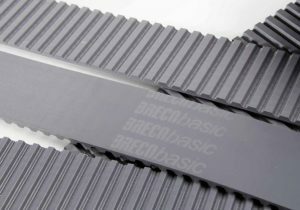 BRECObasic is available as open length or cut-to-size material with anthracite as its standard colour and can be welded to form endless belts if required. Co-extruded, coated belts are available for the tooth profiles T 10 and AT 10 in the coating versions T, T-groove (TR 1), PU yellow basic and Supergrip basic. Polyamide coating (PAZ version) on the tooth side is also available.